Move over, James Bond – here come Ella and her friends! The teacher’s dream has finally come true. He’s been promoted to principal of the school. In their latest adventure, Ella and her friends encounter a frightening digital doodad-thingy. They use secret agent tools and disguises, and finally make the leap into the digital world! This is the 18th book in the super-popular Ella and Friends series that has sold more than million copies worldwide. It’s guaranteed to make the whole family laugh! 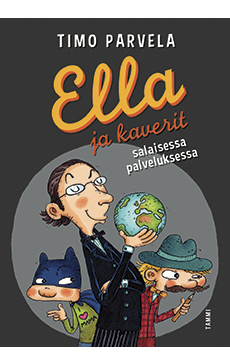 Timo Parvela is one of Finland’s most popular children’s authors. His books have been translated into 25 languages and have won many awards.